Jemaa el-Fna is noisy. It’s noisy to the point of overwhelming for an introvert like me. Too many people in one place make me very anxious. If you’re not anxious, you’ll no doubt be able to soak it in. If you’re like me (you poor thing) you might have to do Jemaa el-Fna in several short trips. It doesn’t seem to matter when you visit; it’s always crammed with locals and visitors. The noise of constant shouting, calls to prayer, and general trade is non stop. There’s no limit to the goods you can pick up in Jemaa el-fna. Expect to barter with your vendor to avoid being vastly overcharged when it’s understood that you’re a tourist. Many of the items, including pashminas, tagine, pots, pans, decorative pottery and souvenirs are cheap anyway, so you needn’t barter too hard. There are many formal restaurants dotted around the outer perimeter of the square (and by that I mean they’re housed in actual buildings and aren’t mobile or carts selling street food). These have set prices and often offer a good deal on the menu du jour or menu of the day. They are more expensive than street traders as you’re also paying for your surroundings. On the street, you’ll find a range of traditional foods, such as tagine, salads, couscous and kebabs/skewers, but it’s also easy to find burgers, panini and pizzas here. The square, whilst constantly on the go, really comes to life when the sun goes down. You can find singers, and guitar players, as well as more traditional tunes, piped through speakers. Snake charmers are always present and I spotted several tiny monkeys (one dressed in a Messi Barcelona top), chained to their owners and looking a little forlorn. Donkeys are also constantly moving through, but these are primarily used for moving heavy items and not purposely for entertainment value. If you fancy taking a carriage ride, however, there are numerous horse and carts available to ferry you around the city. These are located just off the main square. Rather brilliantly, it’s also a common place for donkeys to pass you on the main roads. You will often give way to them from the back of your car as they navigate a roundabout with very relaxed looking owners. Seriously; it’s quite a sight. Some of the more tourist orientated restaurants will serve alcohol, but many do not. Morocco is a Muslim Nation and alcohol is forbidden. Tea and coffee and soft drinks are plentiful in every bar and restaurant and the street vendors also offer a range of freshly squeezed orange and pomegranate juices, which are pressed as you wait. The twinkling of starlight and the rows of fairy bulbs make Jemaa el-Fna a totally different experience in the evening. Head to one of the many rooftop terraces and take in the view from above. The square is massive, but it’s not until you view it from height that you realise the sheer scale of it. It’s a kind of organised chaos. The Waha bar is a great spot from which to view the square and the Koutoubia Mosque. The Argana, on the opposite side, is a popular spot for visitors and also offers wonderful views. The Argana was subjected to a terror attack in 2001, which blew out the restaurant and killed 17 people. It seems fairly straightforward until you experience a dozen people all shouting at you at once. They all seem to be desperately trying to guide you into their restaurant or shop, or just randomly trying to catch your attention so they can attempt to sell you something. It can be quite an exhausting experience. A lot of vendors will accept a simple ‘No thank you’. Others, however, will literally follow you down the street to continue harassing you. On occasion, refusing an offer will also result in some random man being pretty rude to you. This gets old really quickly. You’ll soon learn to keep your head down and not let the constant pushing and pulling ruin your enjoyment. Unfortunately, even stopping for a few seconds to chat to your partner will result in you being leapt on (figuratively speaking) by some rather persistent traders. It’s a shame, as it meant that I refused to really look at anything for sale as it wasn’t worth the harassment. If I’d been left alone to browse, I’d have happily bought a ton of stuff to take home. As it was, I hit up the African supermarket back in Wales, which made me a little sad. Obviously, lots of people thrive on this atmosphere and love bartering. Not everyone will be as happy to get out of the square as I was. It does make sense to keep the pressure you will undoubtedly experience in mind. This way, you won’t be too stunned if you haven’t experienced a large market before. Even the Grand Bazaar in Istanbul was tame compared to Jemaa el-Fna. And I visited in January. Clearly, no one goes with the intention of being disappointed, so just be prepared. Don’t carry around too much cash or valuables as it is really crowded. If you’re covered up and prepared, a visit to Jemaa el-Fna square is an unforgettable experience. It certainly became the talking point of our visit and I’m glad to have spent time in such incredible surroundings. 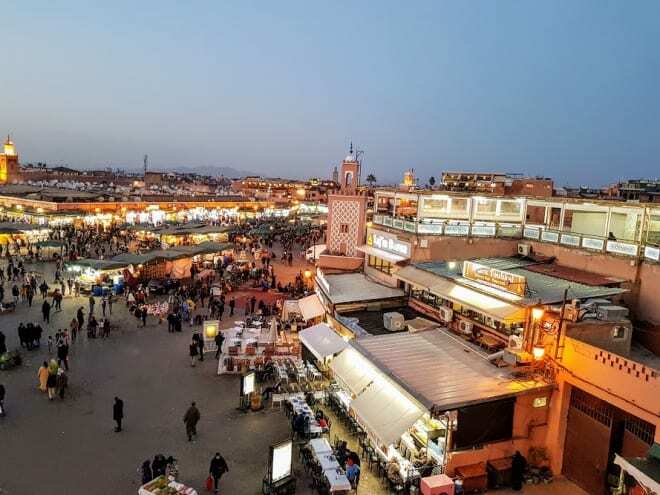 Have you visited Jemaa el-Fna? Did you enjoy your visit or was it too much for you?